I was reading a bit about the Wogglebug and Noisering and decided to try and make something similar. Then I got sidetracked. The basic idea here is a sequence of random or pseudo-random events where the value for each step can change based on chance. This is accomplished via a stepped series of triggered S&Hs that sample a common input. 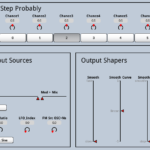 This sound can be used to create sequences that range from fully random to shifting pseudo-random to fully periodic. A chance value of 1 will always trigger the S&H. When used with the LFO input, you'll get a periodic stepped sequence. A chance value of 0 will never trigger and continue to output the previously 'stored' value. A freeze toggle will immediate set the chance for all steps to 0 and the values will not change until the freeze toggle is released. A visual step indicator displays which step is being outputted. The input is mix of different types random values and a LFO that can be modulated by a second LFO oscillator. The second LFO can also modulate the input mix between the random source and LFO. The LFO is synched to the master BPM with the ratio value that divides the master clock by that amount. Random source can vary from white > pink > walk (with adjustable step size & reset). Walk is synched to master BPM. Zero input toggle silences the input and if the step is triggered, the stored value will return to zero. Output can be smoothed (with wet/dry mix) and also has a scale & offset. There is no sound generation included with this sound but, if you want to see what is happening, view with the oscilloscope. Included are two helper wave files for the LFO section that allow you to switch between triangle and saw values for the main LFO and sine and triangle for the secondary LFO.